Alex gets a Song from the West Stand. First up get well soon Aussie John who didn’t make yesterday’s game, but I will see him later as we are nipping up to the hospital today. 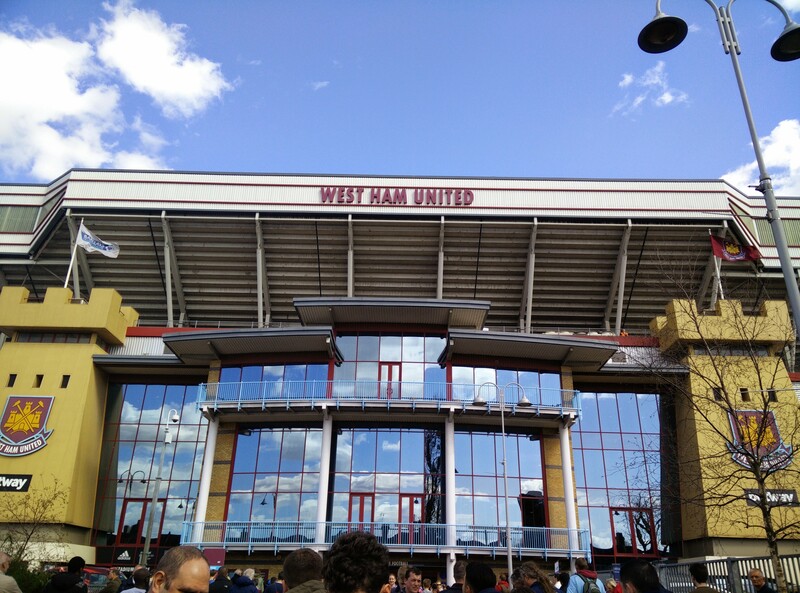 Post our semi dramatic (although not as dramatic as others, LOL) exit from the League Cup, it was back to the Premier League for West Ham, and the visit of Southampton FC. Southampton had spent most of the summer selling their best assets to Liverpool and Man Utd, and West Ham had been strengthening their squad and continued to do so, with the addition of Alex Song on a season loan from Barcelona being announced just before kick off. So it all looked like a West Ham win. Great team, great passing, great to watch, big away following, noisy away following, will upset a few big teams, too good to go down, not good enough for Europe. 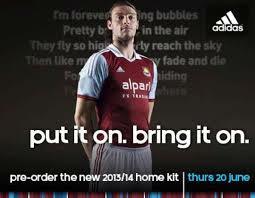 Once upon a time you could guarantee people would be taking about West Ham. These days its more likely that they are talking about Southampton. Southampton came in good form, as they have held onto all season, but were running into a WHU team who themselves were on a good run. The game started (after the minutes applause for the passing of the legend that was Sir Tom Finney) with Southampton on fire and we were chasing shadows if I’m honest and it was no surprise when they took the lead after 8 minutes. The manner of conceding our first goal in over 4 games was more disappointing. There were 6 West Ham players in a row, marking space rather than players and this allowed Yoshida to ghost in unopposed to get his first goal of the season. 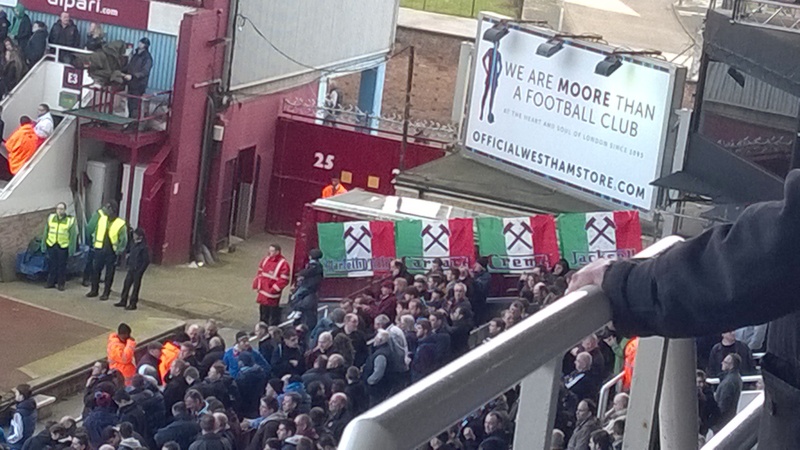 We didn’t have to wait long for the next goal, as the Hammers didn’t relent the pressure on the Saints. 3 minutes after the leveller, Carton Cole jumped out of the pack to bullet a header against the post, and the rebound came back to him (from Yoshida’s arm – another pen ?) 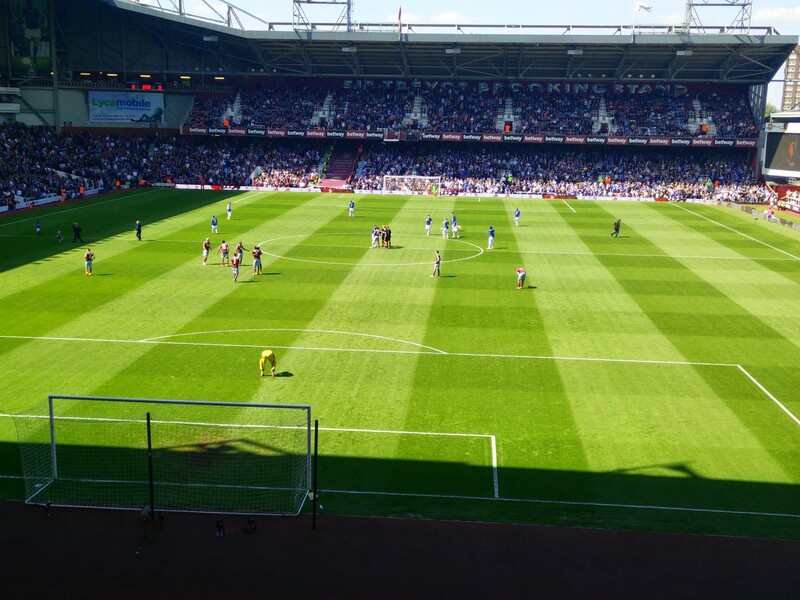 and rifled in WHU’s second to make it 2-1 WHU after 23 mins. 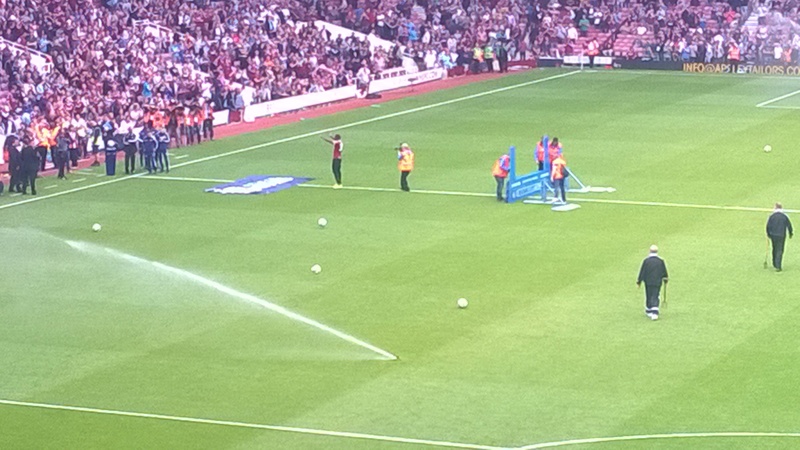 For the first time this season, football had broken out at Upton Park. 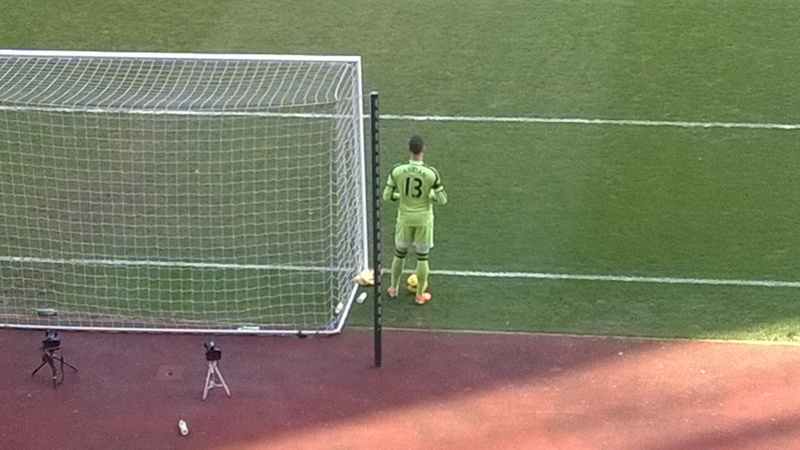 Southampton continued their possessional play, and might of felt aggrieved not to be level at half time. 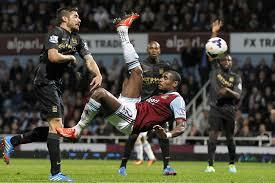 Adrian did his part again and so did Guy Demel, making some key interventions and clearances. The scoreline was interesting for me as Mrs MrBen had had her first ever football bet today. She picked WHU to win 2-1, so was hoping for a drab second half to ensure £100 quid into her pocket. To be fair she looked good for it as the second half didn’t really live up to action of the first. WHU as usual, had a period of play where they gave Southampton some opportunities to level, with both Adam Lallana and Gaston Ramirez wasting chances. However come the 71st minute, a lovely cross from Stewart Downing met the industrious Carlton Cole who nodded it down for Kevin Nolan to fire in an overhead kick from 5 yards out to bring another 3 points to Hammers. For once a comfortable win, to confirm their top half league aspirations, and extend their current form to 4 wins, one draw and only one goal conceded. And a game where the score was about right. If Diame’s speculative shot near the end hadn’t just hit the bar, but had gone in, the scoreline would of been unfair to Southampton. 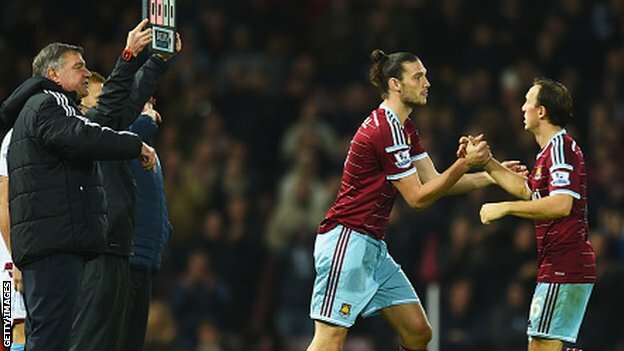 This game has probably won Sam the manager of the month award for Feb as well, without Andy Carroll for most of it. Things are looking good for the Hammers, and with Newcastle and Southampton slipping up more than expected currently, I don’t think we have finished our table climb. I was eyeing up Man U yesterday but their win against Palace probably makes them an unrealistic target now. So some points of note. Sam has maintained then when the team is fit we can match anyone, and despite my reservations, he may be right. One other point is one I started last game. Adam Lallana on Sky commentary this morning, was being lauded as a cert for the plane to Brazil. Mark Noble played him off the park, and once again dominated a game with tackles, pick ups and directing play. He deserves a look in, if nothing else. I have also decided to add a new feature to the blog, The Bloke Behind Me. Now this guy has been there some time, and comes out with the most inane nonsense, week in week out . So for the in inaugural TBBM, we have “James Collins has probably been our best player this season, but i wouldn’t have him in the team” Nice one mate. The only thing that will stop this feature is the 67 year old Angry John clumping him , so I have that in my influence sphere ! Nice to see Aussie John yesterday as well, coming back for a beer, even though he does live the far sticks of Essex these days. MOTM for this week was once again Mark Noble. Another game dominated. This man wears the no 1 jersey next season. Without a doubt.